Mud Sweat and Gears Round 7 – Radical Bikes, Chelmsford. A rare lie in for me on race day, as the local venue of Radical Bikes in Chelmsford was only a very comfortable 30-minute drive away. With the usual pre-race day prep done the evening before, just the bikes to load up and then we were away, all in all an unusually relaxed exit from the house! On the journey, Daniel quaffed his breakfast in the back seat and Adam became chief navigator up front to get us to the correct venue whilst avoiding everything to do with the V Festival on route. We arrived at about 8 and the early (HMTBC) birds had been extremely busy and already had the gazebo erected and secured to the ground. Daniel was particularly excited when we arrived as he had convinced me (or was it my idea?) 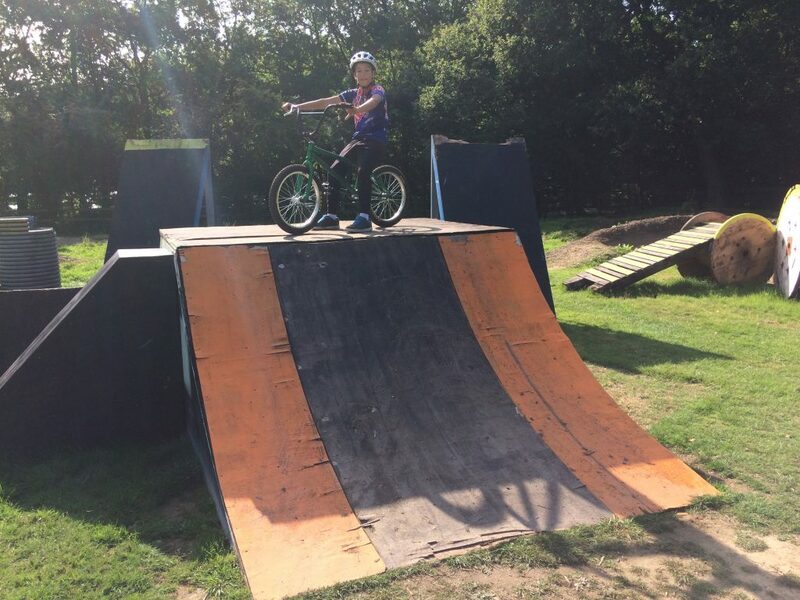 to take his bmx with us, because for anyone that hasn’t been to Radical Bikes before, it is crammed with jumps, ramps, pump tracks and a foam pit. Once all the morning Hadleigh racers arrived we all got ready and set out on a siting lap. It seemed pretty much the same as last year, with the course being roughly split into 3 distinct sections, the first being a wide open grassy stretch to disperse the field after the start, followed by fast but narrow single track twisting its way through the woods and then finally (and for me the most fun part) the twisty sections though and around the many bomb holes that litter the woods, not as fast as the single track but quite technical in places with a few A/B lines to choose and many roots and off camber sections to catch out the unwary. At each of the features, the usual team discussions on technique and line choices take place and we ensure everyone is happy and capable of completing the chosen lines. Now back to the gazebo to get ready to race! 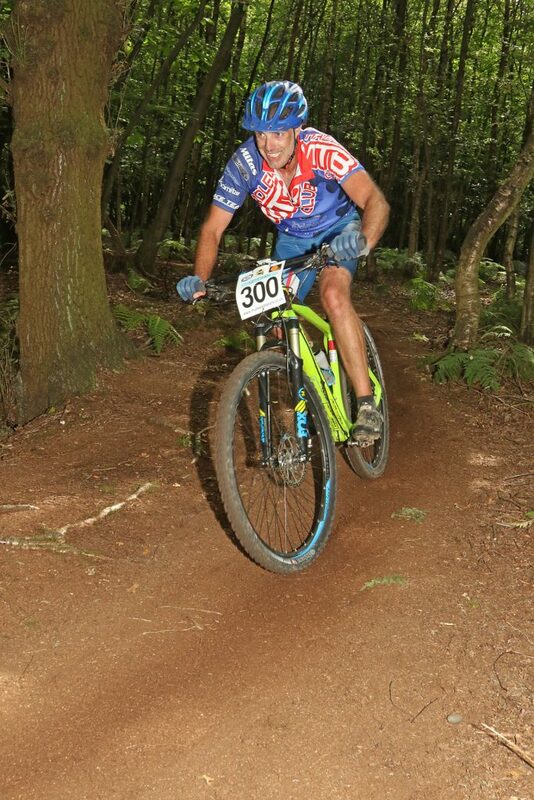 10am race was up first and as usual, Hadleigh was well represented in most categories. Notable results were as follows: - Open Male included another strong performance for Mark Darley in 5th hopefully guaranteeing a Top Three finish this season, and also Brad Hurr for securing a seasons best 31st, this being a great reward for all the effort he has been putting in at training. The Youth race saw another great battle between Hadleigh’s Joe Champness and Alfie Cunniffe with Joe just edging Alfie back into 8th place with a great last lap surge. Also, it was great to see Adam Cavalla finishing in a strong 10th position after a run of bad luck with mechanical problems in the last two races. 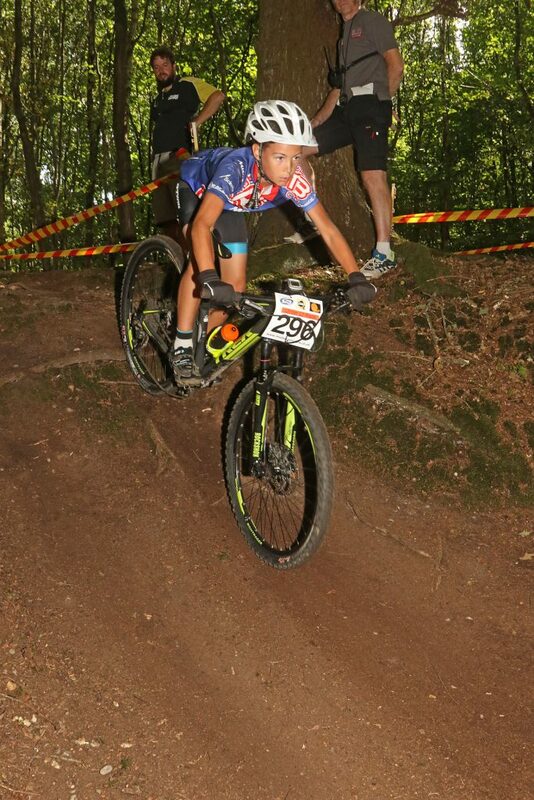 The under 9’s and under 12’s were off next and the younger team members were flying the flag for Hadleigh. Hannah Phillips secured an impressive 5th in the U12 Girls and Zoe Porter gained 6th in the U9 Girls. After the morning podium presentations, it was then time to prepare for the afternoon races. Male riders in the Juniors, Vets and Grand Vets were all represented by Hadleigh. After a quick sighting lap with Travers Bikes’ Jake Darragh, I prepared for gridding. I was on the second row and after a bit of banter with the other Vets, the commissaire announces ‘anytime in the next 10 seconds’ and then it’s all serious as the gun sounds and we’re off! The long charge along the grass to get into the woods was quite frantic and I had to back off for a split second as I was getting edged out into the tape. We all entered the woods without incident and I managed to hold my position into the narrow single track sections. I lost a place or two about a third of the way into the lap but then we were into the last third and this is where I felt most comfortable. Within this last third there was a section of track that us Hadleigh racers had identified as a short cut. Essentially the racing line went round in an arc right to left but to the immediate left there was fallen log (within the taped confines of the course) that if you could bunny hop it, meant you could gain an advantage! I had been last in a train of 4 riders on entering this section and came out second – result! A few grunts and groans from the other riders having missed that opportunity by hey that’s racing! I worked hard and managed to pull away from this group. I managed to pick up the occasional wheel to follow but ended up doing the middle section of the race mostly on my own. At the start of lap 5 I caught up with another rider and rode on his wheel along the grass stretch. It felt good to get the benefit of this but I think it came at a price as my pace had dropped and a quick glance over my shoulder revealed two Vets riders seemingly catching me back up. I pushed on as hard as I dared but on the final lap the two riders had caught me and then overtook me entering the final third of the lap. With my legs now screaming I just managed to hang onto them both. 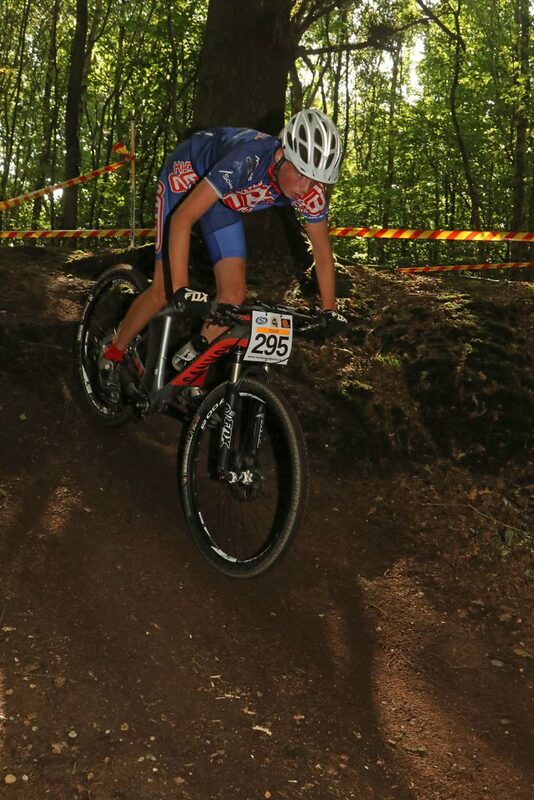 As I was confident in this section I figured if I can keep with them it may end up in a three-way sprint for the line! As the lap was nearing completion the rider in front of me tried an optimistic overtake on the rider in front and entered the next bend too fast and slid out. We both passed him as he picked himself up seemingly ok. So, it was just the two of us now, being the gentleman, I reminded my fellow rider of the bunnyhop log shortcut I’d used earlier to good effect which was fast approaching and to my amazement he missed it again, but I wasn’t going to miss my opportunity, so over I went and back in front again! Having been seemingly gifted the two places I thought I’d lost earlier in the lap I wasn’t going to give them up again and managed to hold out with a strong finish (thanks to Ian Webb for going way off the racing line to allow me to pass quickly and well done too on gaining a seasons best result!). As I was getting my breath back, Adam returned from the results tent to say I’d finished in 12th, with my previous best being 15th I was more than pleased. With Rob Staines winning the Junior race too, I think the majority of the Hadleigh team went home happy with their performances, kudos to you all! One to go, see you all at Langdon Hills in September. Thanks to Mitas for the tyres, Hardnutz for the helmet, Scimitar for the race kit and Cyclewrap for the team sponsorship.